The determination of the need for legal services and the choice of a lawyer are extremely important decisions and should not be based solely upon advertisements, certification, specialization or self-proclaimed expertise. A description or indication of limitation of practice does not mean that any agency or board has certified such lawyers as specialist or expert in an indicated field of law practice nor does it mean that such lawyer is necessarily any more expert or competent than any other lawyer. All potential clients are urged to make their own independent investigation and evaluation of any lawyer being considered. Memberships and offices in legal fraternities and legal societies, technical and professional licenses, and memberships in scientific, technical and professional associations and societies of law or field of practice does not mean that a lawyer is a specialist or expert in a field of law, nor does it mean that such lawyer is necessarily any more expert or competent than any other lawyer. All potential clients are urged to make their own independent investigation and evaluation of any other lawyer being considered. Amendments to the United States Bankruptcy Code adopted by Congress in 2005 require certain disclosures in advertising concerning bankruptcy services offered by attorneys who represent certain individuals in bankruptcy cases. The Knudsen Law Firm is a debt relief agency. We help people file for bankruptcy relief under the Bankruptcy Code. This website is owned, controlled and operated by Knudsen, Berkheimer, Richardson and Endacott, LLP (“The Knudsen Law Firm”), a Nebraska limited liability partnership. The Knudsen Law Firm maintains its office at 3800 VerMaas Place, Suite 200, Lincoln, Nebraska 68508. The managing partner is Jeanelle R. Lust, at that address. The Knudsen Law Firm provides this web site and its contents as a service to its clients and to the general public and for informational purposes only. No information provided on this site is intended to be a substitute for consulting with competent legal counsel. Use of this site does not create an attorney—client relationship between the user and the Knudsen Law Firm. The attorneys practicing at the Knudsen Law Firm are licensed in the State of Nebraska, and while many of our lawyers are licensed to practice law in other states, the information provided on this site is limited, unless otherwise specified, to Nebraska law. Provisions of relevant law vary from state to state, and the practices, suggestions and results discussed in the materials on this site under Nebraska law may not be possible under law applicable to the user’s specific legal situation. Users are encouraged to consult with a lawyer licensed to practice law in the state in which the user resides, or in the state in which the user’s claim arose. Please contact our attorneys directly using the contact information provided on this website if you seek legal advice on any issue. Please do not send any information concerning the nature of your legal issue prior to speaking directly with one of our attorneys. Firm policy requires that our attorneys conduct a conflict of interest search before being engaged to represent any potential client. The Knudsen Law Firm tries to keep the content on this website current. However, applicable law may change from time to time. While The Knudsen Law Firm strives to keep articles on this site current, no warranty of any kind is made with regard to the contents of this site. There may be hyperlinks to other materials on this site and while all of the hyperlinks were checked at the time they were inserted into the materials, it is possible that the hyperlinks may not work at all times, or that the hyperlink may no longer be valid. No warranty or representation is made concerning any material on any site linked to or from this website. Some of the materials contained on this website may be considered advertising in some jurisdictions. Some jurisdictions regulate attorney advertising differently than does the State of Nebraska. Our primary office is located in the State of Nebraska and to the extent that any materials on this site are deemed to be advertising, those materials should be deemed to have been delivered in the State of Nebraska for use in the State of Nebraska. Our attorneys are not licensed to practice in any state, other than those listed in the attorney biographies contained on this site. Nothing contained on this site shall be construed as providing legal advice to any user or visitor to this site. Links to other sites are provided for your convenience only. They are not affiliated with Knudsen Law Firm. These links are not intended to be endorsements of or referrals to the linked sites. The firm has no control over these linked sites and is not responsible for their content. The firm also disclaims all responsibility for the privacy practices of the linked sites. 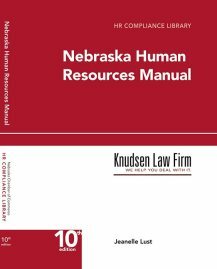 The Knudsen Law Firm complies with the requirements of the Nebraska State Bar Association concerning confidentiality of client communications. The Knudsen Law Firm does not sell or disclose any personal information to any third party. The Knudsen Law Firm reserves the right to disclose information to law enforcement authorities, or other governmental agencies as required by law. Testimonials displayed on this site are individual experiences, reflecting real life experiences of those who have used our services in some way or other. However, they are individual results and may not be representative of the experience of others. We do not claim that they are typical results that consumers will generally achieve. The testimonials are not necessarily representative of all of those who will use our services.